"Red mite" redirects here. For the red spider mite, see spider mite. 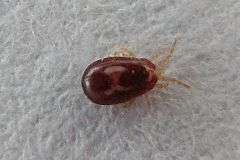 Dermanyssus gallinae (also known as the red mite, poultry mite, red poultry mite, roost mite and chicken mite) is an ectoparasite of poultry and other bird species. The mites are blood feeders and attack resting birds at night. They are generally white or greyish in colour, becoming darker or redder when engorged with blood. After feeding, they hide in cracks and crevices away from daylight, where they mate and lay eggs. The mite progresses through 5 life stages: egg, larva, protonymph, deutonymph and adult. Under favourable conditions this life cycle can be completed within seven days, so populations can grow rapidly - causing anaemia in badly affected flocks of poultry. Young birds are most susceptible. The mites can also affect the health of the birds indirectly, as they may serve as vectors for diseases such as Salmonellosis, avian spirochaetosis and Erysipelothrix rhusiopathiae. Dermansyssus gallinae will also bite some species of mammals, including humans, sometimes causing dermatitis and skin lesions, Ectoparasites from feral pigeons affecting humans. Dermanyssus gallinae is being increasingly implemented in dermatological complaints in non-avian hosts, suggesting that its significance may extend beyond poultry. The main objective of the current work was to review the potential of D. gallinae as a wider veterinary and medical threat. Results demonstrated that, as an avian mite, D. gallinae is unsurprisingly an occasional pest of pet birds. However, research also supports that these mites will feed from a range of other animals including: cats, dogs, rodents, rabbits, horses and man. Increasing reports of bird-mite attacks on humans and mammalian companion animals suggest that avian mite ectoparasitosis/dermatitis (gamasoidosis) may be of increasing medical and veterinary concern. Though several species of bird mite from multiple genera may be responsible for gamasoidosis, D. gallinae is most commonly implemented as the causal agent. In cases of human infestation, positive identification of species (or at least functionally similar groups based on life-history patterns) and recommendation of suitable treatment requires an understanding of mite taxonomy and ecology that many healthcare professionals and pest control organizations do not currently possess. The mites normally feed around the breast and legs of hens, causing pain, irritation, and a decrease in egg production. Pustules, scabs, hyperpigmentation and feather loss may develop. If they are present in large numbers, D. gallinae can cause anemia in hens which presents as pallor of the comb and wattle. A presumptive diagnosis can be made in flocks of laying hens, usually based on a history of decreasing egg production, anaemia and mortalities in young or ill birds. Blood spots on eggs indicate infestation within the cloaca of an affected hen. Definitive diagnosis is only achieved following identification of eggs, feces or the mites themselves. Predatory Mites and Ectoparasiticides can be used to treat affected poultry. Predatory Mites are sold and distributed internationally and throughout the United States as an effective solution. Amblyseius andersoni is an effective predatory mite for target pests including Red Mites. For Ectoparasiticides, these chemical controls, if used, should be used in rotation to avoid the buildup of resistance. Red mites can survive for up to 10 months in an empty hen house. Creosote treatment of wood will kill mites. Prevention of infestation in a human habitation consists of eliminating vectors (pigeons in eaves, infested backyard poultry, etc.). Elimination of an infestation in a human habitation is best achieved through a combination of eliminating potential vectors (nesting pigeons, backyard poultry, etc. ); reducing potential hiding places (rugs, clutter); judicious use of pesticides; consistent use of dehumidifiers to maintain a low humidity environment; maintaining a low temperature in the environment; frequent thorough cleaning; minimizing the amount of time spent in the home; and maintaining excellent hygiene and exercise habits. Treatment of infestation may require topical and oral medication such as ivermectin and may require several months to eradicate. ↑ Chirico J, Eriksson H, Fossum O, Jansson D (June 2003). "The poultry red mite, Dermanyssus gallinae, a potential vector of Erysipelothrix rhusiopathiae causing erysipelas in hens". Medical and Veterinary Entomology. 17 (2): 232–4. doi:10.1046/j.1365-2915.2003.00428.x. PMID 12823843. ↑ Bellanger AP, Bories C, Foulet F, Bretagne S, Botterel F (March 2008). "Nosocomial dermatitis caused by Dermanyssus gallinae". Infection Control and Hospital Epidemiology. 29 (3): 282–3. doi:10.1086/528815. PMID 18205530. ↑ Akdemir C, Gülcan E, Tanritanir P (2009). "Case report: Dermanyssus gallinae in a patient with pruritus and skin lesions". Türkiye Parazitoloji Dergisi. 33 (3): 242–4. PMID 19851974. ↑ George D, Sparagano O (March 2015). "Should the poultry red mite Dermanyssus gallinae be of wider concern for veterinary and medical science?'". Red Mite infestation in houses Infestation is not limited to chicken coops. Red Mite Information on Accidental Smallholder and close up photos for smallholders and backyard chicken keepers. The Year of the Mite Infested by poultry mites from baby chicks, Jane Ishka explores what is known about how these mites infest humans and, most importantly, how to get rid of them.